Voesh's Collagen Gloves provided pampering, convenient backstage manicures at Prabal Gurung and Philipp Plein's Fall/Winter 2018 runway shows. Nail techs used Voesh's Collagen Gloves to pamper models' hands backstage at the Philipp Plein and Prabal Gurung Fall/Winter 2018 New York Fashion Week shows. Like a sheet mask for the hands, the waterless manicure gloves moisturize skin without the need for soaking in water, cuticle softener, cuticle oil, massage lotion, or paraffin wax, making them a convenient, professional manicure option. The gloves' perforated tips made it easy for the models to continue to take snapshots and get their nails done while enjoying a relaxing, skin-softening hand treatment. 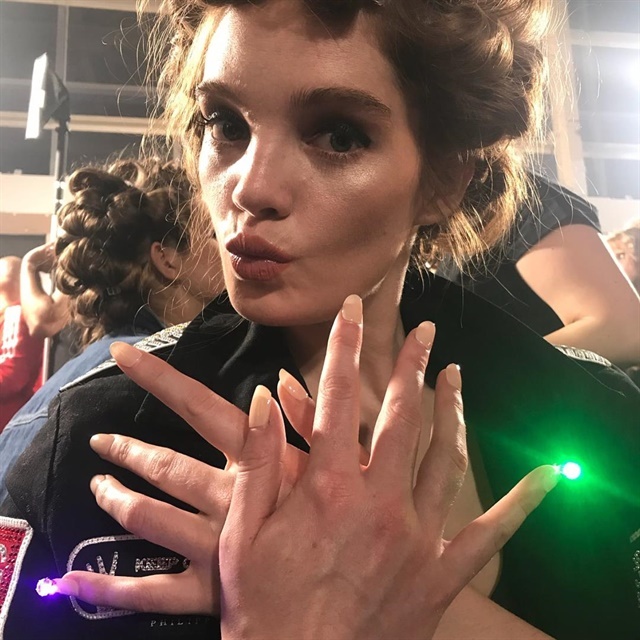 At the Philipp Plein show, the waterless manicure system meant models were able to wear the Collagen Gloves as manicurist Mei Kawajiri applied glowing LED light accents to their nails, a look that matched Plein's bold and flashy collection. Check out all the New York Fashion Week nail designs in this photo gallery.